The holiday season approaches! 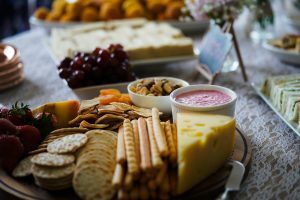 Halloween is over, which means turkey, stuffing, eggnog, and party cheese platters are on the way…but what about for all the pregnant folks? 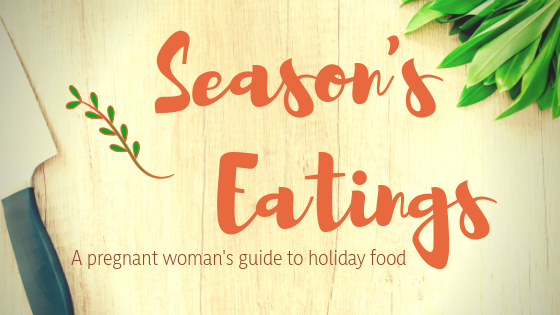 There are definitely some holiday eating do’s and don’ts during pregnancy. Read on to find out how you and baby can stay safe while still digging in to some festive favorites! The main reason for concern when it comes to holiday pregnancy eating is the same as it is all year round: our immune systems are weaker when we’re pregnant. We’re at an increased risk for foodborne illnesses caused by microscopic villains such as E. coli, Listeria monocytogenes, Salmonella, and Toxoplasma gondii. These are all bacteria, viruses, and parasites that can grow in undercooked foods. This can lead to serious issues for you and baby, including miscarriage, premature delivery, birth defects, and death in newborns. But have no fear, with the right information you can enjoy holiday meals without running into these risks. 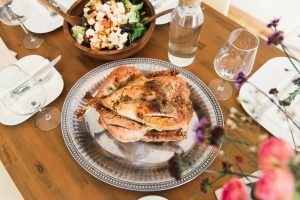 If turkey is a staple for you and your family during the holidays, you don’t have to worry about missing out! As with all meats that you would eat during pregnancy, make sure that the bird is cooked until it reaches 165℉. Check with a meat thermometer, don’t just guess by looking at it. If you’re a stuffing fan, make sure to check that the stuffing reaches 165℉ as well if cooked inside the turkey. The USDA states that it’s safest to avoid pre-stuffed turkeys. The best way to avoid foodborne illness would be to cook the stuffing outside of the turkey. Eggnog can be a hazard for two reasons. If it’s spiked, take a hard pass, as the FDA and American Academy of Pediatrics state that no amount of alcohol is safe during pregnancy. Secondly, many eggnogs are made from raw eggs, which could contain salmonella. 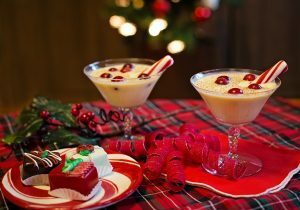 Some commercially-manufactured eggnogs are made with pasteurized eggs and are safe for any pregnant mamas needing a ‘nog fix. Apple ciders can also be a breeding ground for salmonella and e. coli if they’re made from unpasteurized juices. 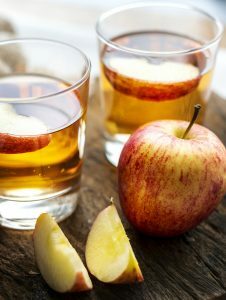 Unless you know for sure the juices are pasteurized, skip out on the homemade ciders, including ones from farmers markets and orchards. For a fool proof alternative, try sprinkling cinnamon and allspice on fresh apple slices. The USDA recommends that all leftover foods should be refrigerated within two hours of being left out. Holiday parties can get hectic, so set an alarm to put food back in the fridge before two hours is up. Make sure to reheat food completely before munching on leftovers (165℉). 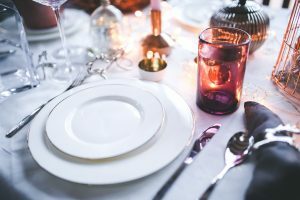 We may need to take a little extra caution than all our not-pregnant family and friends this season, but that doesn’t mean we can’t indulge in the culinary delights of the holidays! If you want to learn more about how to best take care of yourself and baby, check out Lifeline’s other articles and services. Pregnant, parenting, or think you might be pregnant? Lifeline Pregnancy Help Clinic is here for you. Make an appointment today to learn more about our confidential and no-cost services, including pregnancy tests, ultrasounds, counseling, and more.